Accidentally left out some of the sugar so my snickerdoodles weren’t that sweet. Still pretty good though; I’d probably make them again. Supposed this is an ATK recipe but it’s nowhere to be found on their site. 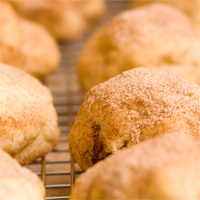 I used this snickerdoodle recipe which claims to be from ATK. My snickerdoodles didn’t flatten out that much.